It is only two rounds into a new QAFL season but already there are only two unbeaten teams – premiers Palm Beach Currumbin and the Surfers Paradise Demons. The weekend’s round produced two thrillers with Broadbeach edging Mt Gravatt by the solitary point and Surfers getting home over Morningside by a goal. The Western Magpies turned it on after half-time to beat Labrador by 51 points and PBC took the spoils over a brave Sandgate by 76 points. There is only one game over the long Easter weekend when Brisbane rivals Wilston Grange and Western Magpies clash on Good Friday at Hickey Park. It was probably inevitable that, in a game that produced a total of 31 of them, it was a solitary behind that sealed a tense victory for Broadbeach against Mt Gravatt on Saturday. When dual best and fairest winner Josh Searl kicked a goal that levelled the scores late in the final quarter at Subaru Oval it appeared the game was headed for a draw. But, shortly after and with the siren set to sound, a Searl set shot wobbled its way through for one of the most precious behinds he has ever kicked to seal victory by 8.19 (67) to 9.12 (66). That kick typified an afternoon dominated by near-misses. Both sides were guilty of botching some easy chances as a game that appeared well in Broadbeach’ s control at half-time swung wildly both ways. The Cats were up by 5.8 (38) to 2.5 (17) at the big break before Mt Gravatt ripped into them and put on six unanswered goals for a 17-point lead at three-quarter time. Sam Stubbs missed some easy chances early but his four majors in the third term helped to put the Vultures back on track. Then, to start the final term, Broadbeach registered six behinds in a row before they finally found the middle of the big sticks via Jackson Fisher and Nick Burton. A terrible third term, when they were outscored 6.4 to 0.2, drew the wrath of coach Beau Zorko who was not backward in coming forward to let players hear just what he was thinking. Whatever Zorko said certainly worked because the Cats took back control of the game and eventually the four premiership points. “It was a heart-stopper, but it didn’t need to be,” Zorko said of the final term effort. “We didn’t take enough of our chances in the first half and our third quarter was probably one we’ll forget. 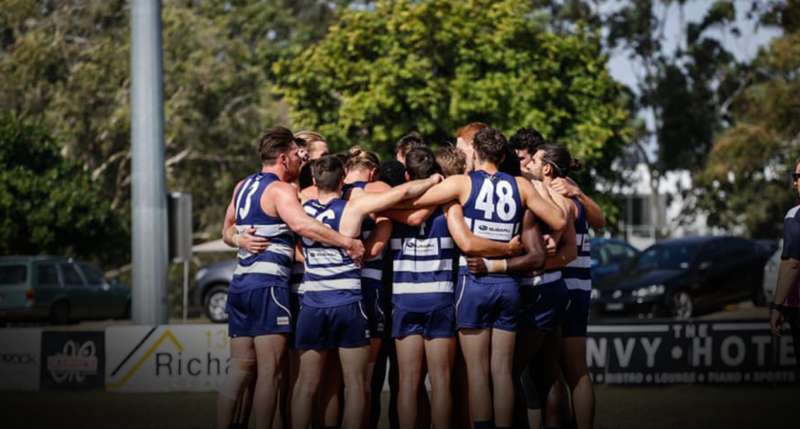 The Cats rode on the back of some hard work from on-baller Nick Burton, Jackson Fisher and Tom Betson, who rucked tirelessly all match up against two much bigger opponents in Andrew Smith and Jarrod Huddy. In the third term the Mt Gravatt big men dominated the centre bounces and explained why the Vultures managed to get back in the game. Even Mt Gravatt coach Adam Boon, who missed playing because of knee soreness, agreed that Betson gave great service to the Cats. Boon described the clash as ‘a funny game’ given the number of one-points it produced. “But you can’t give a good side a start like that and expect to be on top at the end of the day,” he said. “We probably played a half to three quarters of good footy today but unfortunately that’s not enough in this competition. Mt Gravatt lifted after half-time when Boon swung Mick Hamill on to the ball, switched Jayden Crawley and Jonah Licht around at centre half-back and centre half-forward, and pushed young Joel Leahy to the backs looking to generate some run. Full-back James Markham, Smith, Stubbs and hard-at-it Corey McGuren were the pick of the Vulture team. GOALS, Broadbeach: M. Fowler 2, R. Finn 1, J. Fisher 1, B. Chadwick 1, J. Searl 1, N. Burton 1, J. Lyons 1. Mt Gravatt: S. Stubbs 4, J. London 1, F. Neate 1, B. Daly 1, J. Huddy 1, D. MacDonald 1. BEST, Broadbeach: N. Burton, J. Fisher, T. Betson, J. Rymer, J. Searl, J. Newman. Mt Gravatt: J. Markham, A. Smith, S. Stubbs, C. McGuren, F. Neate, M. Hart. Season 2018 finalists Surfers Paradise and Morningside continued their recent run of close encounters with yet another tight one in their clash at Jack Esplen Oval on Saturday. In three meetings last year the biggest winning margin was 10 points, including eight points in the first semi-final, and to start of 2019 it was the solitary goal that won it for Surfers. The Demons took the points and made it two from two to start a new campaign with victory by 13.7 (85) to 12.7 (79). It was not until Southport-listed forward Cory Filewood kicked truly from a tight angle at the 30-minute mark of the final term that Surfers edged ahead. Up until then it was anybody’s game as the rivals traded surge for surge. In the first term Morningside kicked four goals in a row for an 18-point lead at three-quarter time. Then the Dees took over and kicked the only four goals of the second quarter. In the third Morningside ran up four goals in a row before the visitors put on five goals to three in a gripping last quarter. “It was a game that could have gone either way,” new Panthers coach Clint Watts said. “We started off well and had the game on our terms, then they ate into our lead in the second. “The teams got the ascendency for about 10 to 15 minutes at a time, then the other side held them up and took over. Triple club best and fairest Cassidy Haberfield returned to the fray after a late start to the pre-season and marked it with a best-on-ground performance after a great battle with Morningside ball winner Henry Joyce, formerly with NEAFL club Aspley, who turned in his second successive A grade performance for the Panthers. Haberfield took it upon himself to run with Joyce after the latter started with a bang. “Cas likes it in close and was great back in the side,” Surfers coach Brad Moore said. Moore noted the closeness between Surfers and Morningside. Last year the final margins between the sides were two points, 10 points and eight points, so there seems to be a struck match between the clubs. Away from Haberfield, Surfers had winners in Matt Green playing forward and in the ruck, Jack Prestegar off the half-back and Coomera recruit Nick Harrison was good in his debut for the Demons. Watts said both sides had dominant backlines and nominated defenders Nathan Beck and Daniel Frame and wingman James Rayner as his best players. GOALS, Surfers Paradise: N. O’Hare 3, C. Filewood 3, C. McKenzie 1, D. Mutu 1, J. Prestegar 1, J. Yelland 1, K. Ford 1, M. Green 1, M. Doran 1. Morningside: A. Mitchell 2, N. Colenso 2, B. Howard 2, H. Joyce 2, S. Godfrey 1, W. Pendlebury 1, J. Rayner 1, L. Rogerson 1. BEST, Surfers Paradise: C. Haberfield, M. Green, J. Prestegar, J. Yelland, B. Haberfield, N. Harrison. Morningside: H. Joyce, J. Rayner, N. Beck, P. Mollison, W. Pendlebury, D. Frame. A slashing second half from Western Magpies carried them to an impressive 51-point victory over Labrador at McCarthy Homes Oval on Saturday. A dour clash up to the big break turned completely around as the Magpies free-wheeled their way to a feast that netted them eight goals to one. The final result was 13.13 (91) to 6.4 (40), leaving the Tigers winless after two rounds and the Magpies bullish heading into their Good Friday clash against cross-city rivals Wilston Grange. Magpies coach Brydan Morgan thought his side had control of things up to half-time but were unable to convert it as scores were level at quarter-time and the home side ahead by just the point at half-time. After that, though, and it was all one-way traffic as the Magpies put on 8.9 to Labrador’s 1.1. “In the first half I thought we owned the game but didn’t out it on the scoreboard,” Morgan said. “We weren’t getting any efficiency inside our 50. Defence was the key and an area Morgan was pretty happy with after an ordinary time of it when they lost in the first round against Mt Gravatt. “Certainly our back six learned lessons from the previous week and were significantly better this time,” Morgan said. While tall forward Aaron Highlands, normally a regular at the back, kicked three goals it was a defender, Luca Winton, who won the nod from Morgan as his best after a strong effort against Labrador’s tall skipper Bryce Retzlaff. Jack Goodall in a variety of roles around the ground and Drew Mitchell in the middle were other standouts for the winners. Labrador coach Liam Burke thought his Tigers battled well in the first half and were right in the game before a failure to convert several chances hurt badly in the third term when they had just one behind. “Unfortunately, they ran all over us in the last quarter when they kicked all those goals,” Burke said. Burke dispelled any suggestion fitness may have been an issue for the Tigers. Rising young ruckman Lachlan Davidson had his best game for Labrador and put his hand up for permanent selection in the firsts after coming in as a replacement for Andy Hollis. Defenders Dane Watmuff and Ben Walker were solid for the Tigers, who now have the Easter weekend off before a Gold Coast derby against Surfers Paradise. GOALS, Western Magpies: A. Highlands 3, L. Murray 2, J. Goodall 2, B. Lumber 2, H. Kerr 1, K. Reed 1, M. Lonergan 1, T. Baulch 1. Labrador: H. Barry 2, J. Boxer 2, J. Maple 1, B. Retzlaff 1. BEST, Western Magpies: A. Highlands, L. Winton, J. Goodall, D. Mitchell, M. Lonergan, C. Carseldine. Labrador: L. Davidson, D. Watmuff, B. Walker, A. McKay, J. Kenny, R. Lloyd. Sandgate can take cold comfort from the fact that they kicked the fourth highest score of the QAFL’s second round yet still ended on the wrong side of a thumping from premiers Palm Beach Currumbin on Saturday. The young Hawks did well and gave the Lions plenty to think about before sheer class took its toll and the visitors ran away with victory by 24.13 (157) to 12.9 (81) at Lemke Road Oval. It was a final score line that the Hawks did not deserve because they were brave before the floodgates eventually opened up. At quarter-time Sandgate trailed 5.5 to 7.0 and even PBC coach Jess Sinclair said the home side deserved to be at least four goals up. However that was when the Lions got serious and after a Sinclair blast they hit top gear and put on 17.13 to 7.4 over the final three stanzas. “That start did not surprise me at all because it was Sandgate’s first game of the season and they were at home,” Sinclair said. As Nick Crowley in the middle, classy half-back Dylan Troutman, wingman Jesse Derrick and new forward Reyne Harris started to hit their straps, so did the PBC machine. Crowley had more than 30 touches, Troutman kicked three goals after being m oved from a back flank and Harris kicked five goals, a total he matched with attacking spearhead Jack Anthony, who now has 13 goals from two matches to start the new season. Southport-listed Trent Stubbs was also in on the act with four goals. Beaten Sandgate coach Jarad Marsh was disappointed to lose but saw a lot to like as his young charges took it up to the premiers. “I don’t think the final score reflected how contested it was in general play,” Marsh said. “In the first quarter we had 10 scoring shots to seven. Our tackling pressure was up and we generated turnovers. “I think at half-time there were only three or four inside 50s between us so it was absolutely an encouraging start with a lot more positives than negatives. “Twelve to 15 goals usually win you a game in the QAFL, but not when the opposition scores 150 against you. Another positive was the debut of 16-year-old ex-Aspley junior Lachlan Harrop, who kicked three goals in his initial seniors outing. Harrop was one of three teens under the age of 17 used by the Hawks on Saturday. Other stars for Sandgate were full-back Mitch Crawley, who did well on Anthony, and ruckman Luke Bradford. GOALS, Palm Beach Currumbin: J. Anthony 5, R. Harris 5, T. Stubbs 4, D. Troutman 3, J. Derrick 2, N. Crowley 2, T. Cornish 2, T. Thynne 1. Sandgate: L. Harrop 3, A. Fabian 2, J. Taglieri 2, J. Harding 2, D. Haynes 1, S. Cashen-Harris 1, J. Maynard 1. BEST, Palm Beach Currumbin: N. Crowley, D. Troutman, J. Derrick, R. Harris, J. Burge, T. Cornish. Sandgate: M. Crawley, L. Bradford, J. Battaglene, L. Harrop, B. Harding, J. Maynard.